While hiking through Tyresta at night I had to keep a fairly high pace. The reason was very simple: Since I used the cellphone's LED flash for a flashlight, I'd be out of a light if the battery ran out. That meant it would be much harder to navigate to a park exit before sunrise. This was unacceptable. I had to have a light that wouldn't just die on me if I wanted to be able to hike at night. Which I did, since the best time for nature photos is around sunrise or sunset, and being in the middle of the forest at sunset meant you had to get out of the forest in darkness. 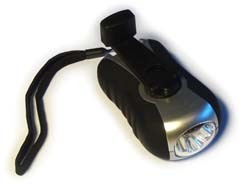 The next day I went to every outdoor and hiking store I knew, and asked for hand-powered flashlightes. All they had were battery powered ones, but that would of course not solve my problem. One person, probably not thinking things through properly, suggested I get a solar panel to charge the flashlight. A dead end since the flashlight would only run out of charge when it was actually being used: At night. Moreover, the solar panel and the charging station were, taken together, about a kilo and the size of a small sleeping bag. Light, small, weatherproof - and without any risk of dying just when needed (unless the capacitor / battery breaks). According to the manufacturer, one minute of cranking gives you thirty minutes of light. I haven't verified that, but the light you get from it is more than enough to find your way around the forest at night.